I wasn't really sure about this layout at first, but I am pleasantly surprised on how it turned out. 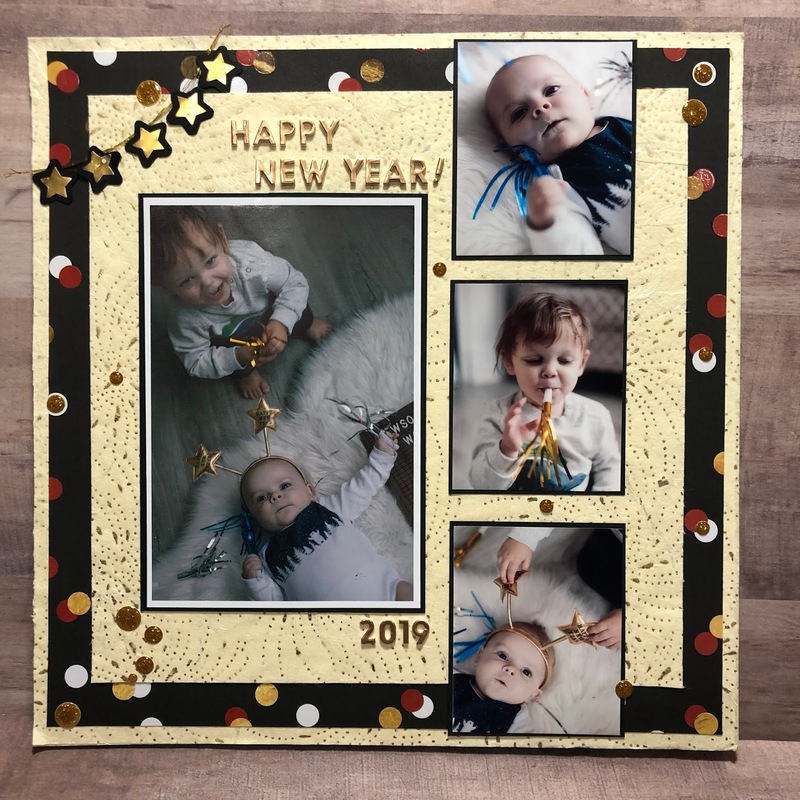 My daughter Ashley took these photos of Sawyer and Dawson on New Years Day. 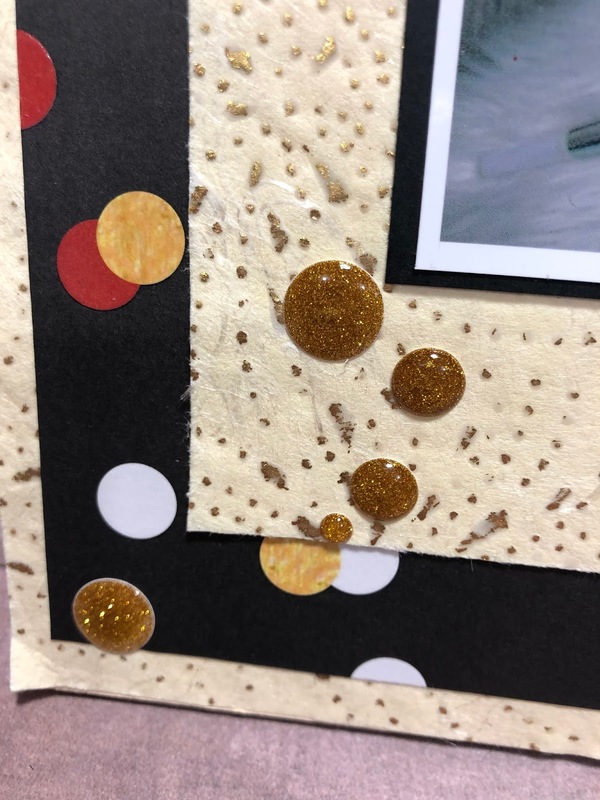 The cream coloured paper in the middle and around the outer edge of this layout is very old paper of mine (like over 10 yrs) it is hand made paper and very fiberous, almost like a fabric. It is also very thin, so I had to adhere it to some cardstock to make it more stiff. I just had to use this paper as it has gold flecks in a fireworks pattern, how could I not! 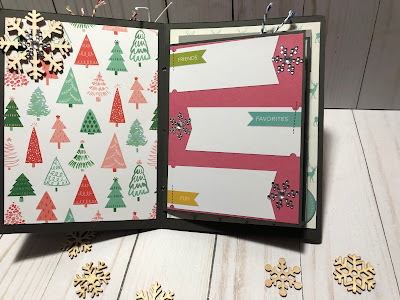 If you saw the back of this paper, you would see that I cut out the center of this paper and adhered it to the middle of the layout....I am so so thrifty with papers! I wanted to make a banner, but I wanted it to be different then my last one......so I used stars! 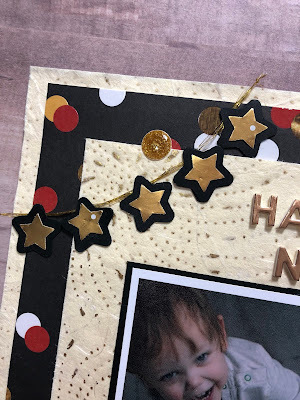 What is fun about the confetti paper is that some of the dots are glossy. I wanted to add even more sparkle to this layout, so I used these sparkly enamel dots scattered around the whole layout. I also made a video on this layout. If you would like to check out more of my video on my YouTube channel, just click on the link "Tracy's Treasures 24"
I am following a on-line course I purchased from SCT 365 2019 . I wouldn't call it a class or a course..but instructional share, lol. 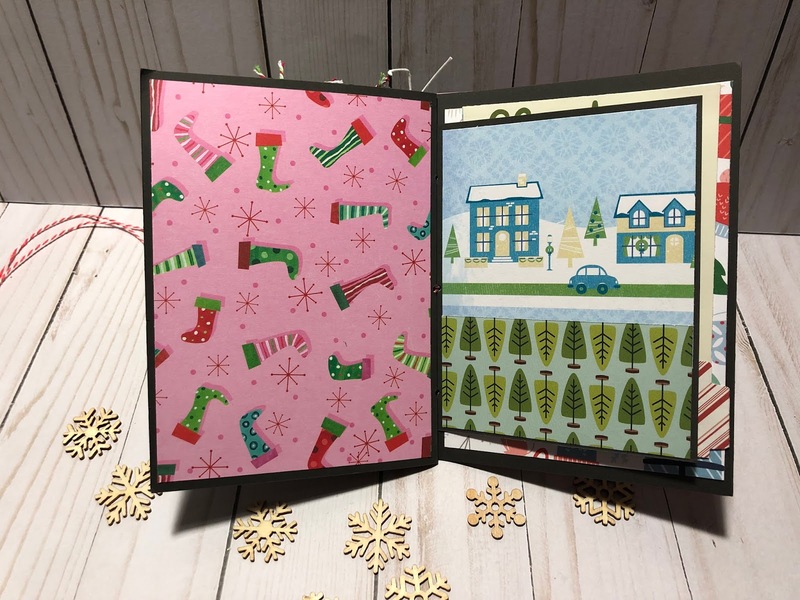 They send you a scrapbook sketch as well as a look at the completed page (pages) that the artist created. You also get detailed instructions on how they created the layout. A bonus to signing up for this is they have a FB page where, all who are signed up, can access to share their work. 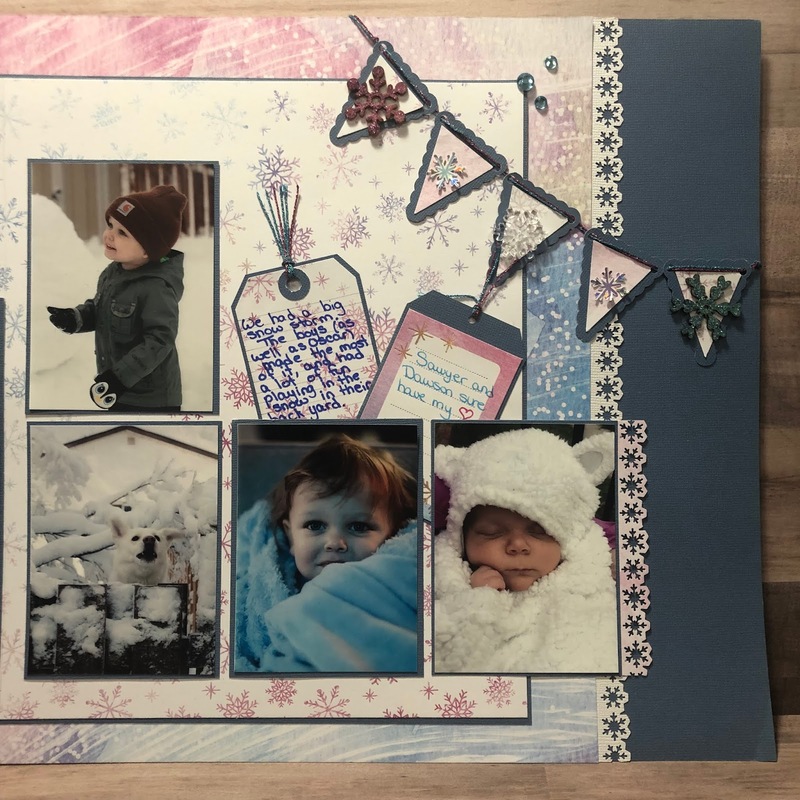 So today I am sharing my 2 page spread on this challenge. Of course it is of my adorable grandsons. This layout is about the boys enjoying a beautiful day out in the snow after one of our snowstorms. I printed the smaller photos on my Canon Selphy CP910 and I love how they turn out. For the 5x7 photo I used my Canon MX420 printer, which also prints photos. I noticed that the 5x7 photo turned out to have a bit of a negative effect when tilted. It could be because I may need more ink, but I'm thinking I will re-print them at a professional photo lab. The boys dog, Oscar, even made the page. That dog is like a kangaroo, lol. He loves to jump. Don't The boys look so cuddly warming up from playing outside. The title words are white chipboard that I coloured with distress inks to match the colours in the papers. 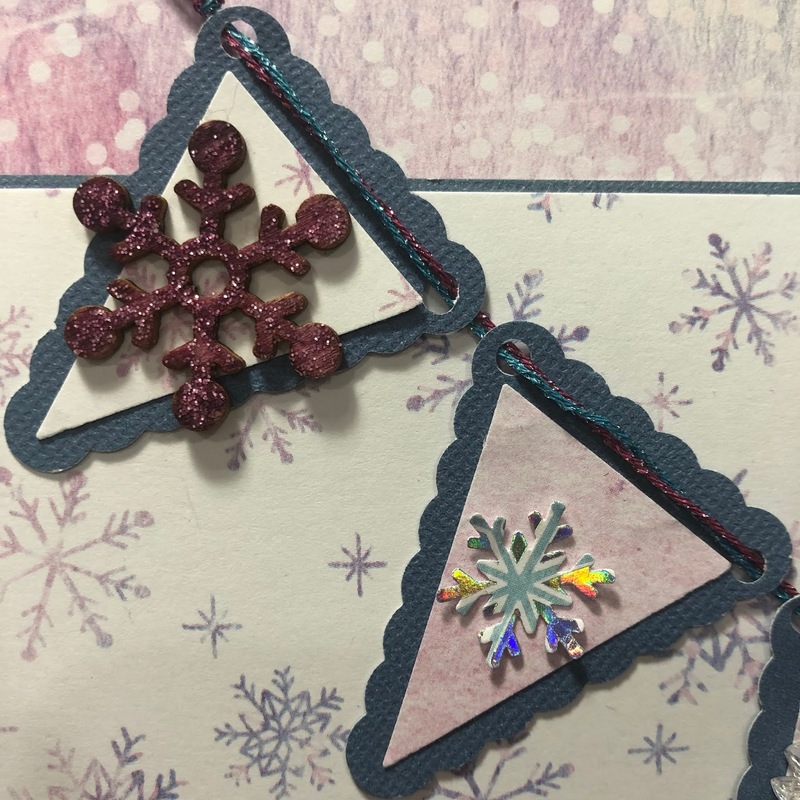 You can see here how this paper has a touch of foil in the snowflakes. 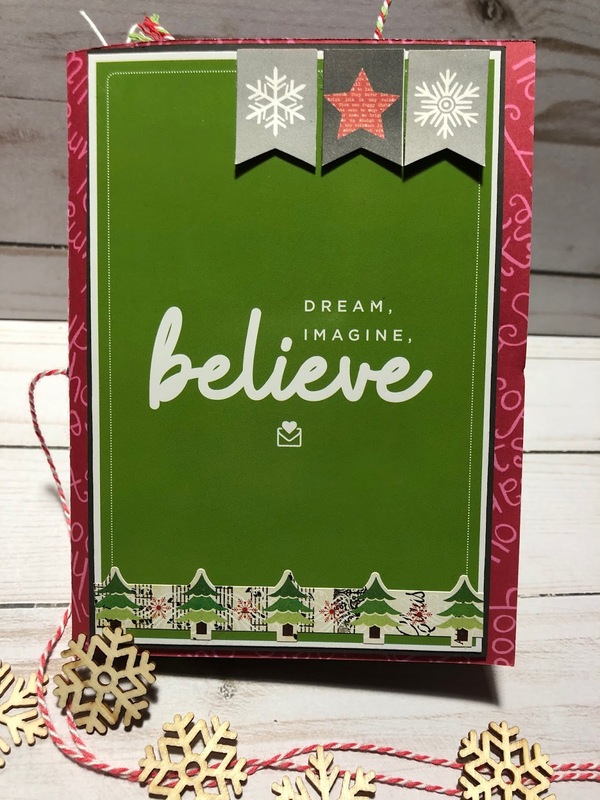 For the banner I used a Stampin' Up banner punch. I inked, then added some stickles to the wood veneer snowflakes. The next snowflake I just punched with a snowflake punch out of the pattern paper. Here are the completed pages! I feel so accomplished to have not only completed a scrapbook layout..but with pictures too!!!! I also made a video of this layout in more detail in my video below. 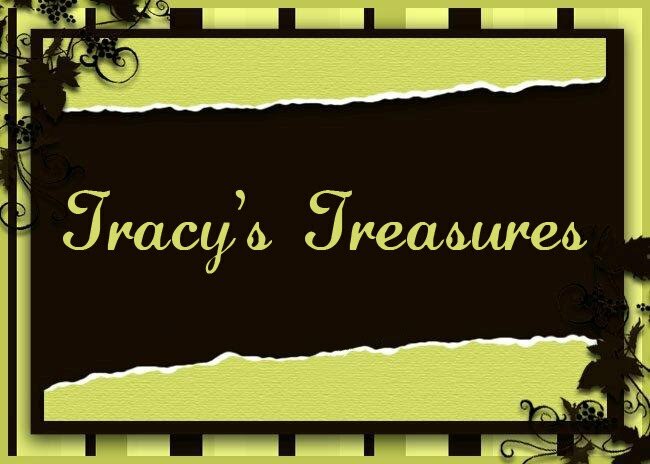 If you would like to check out my other YouTube videos, just click on the link "Tracy's Treasures24". Thank you all for visiting me and all of your sweet comments. I know I have been posting a lot about Scrapbook & Cards Today, but seriously that seems to be what I have been working on lately. 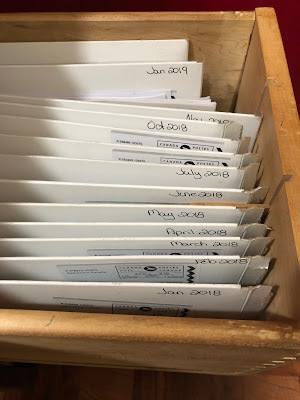 Last year I subscribed for a full year to SCT Sampler. What the sampler is, is it is a package that is mailed to me once a month with sample sized goodies. I am really not much of an on-line shopper, but now I know why so many are, because I look forward to that package and am so excited when it comes to my door. As much as I love to receive it, I haven't been using it. I open it, ohhh and awwww over the contents, then package it back up and stick it in my drawer that I designated to them. But this year my goal is to use each and every one before the next one comes. I may even combine last years month Sampler with the same month I get this year. I have to say SCT hit it out of the park with this one...they rang in the New Year and the new Sampler with a Bang!! 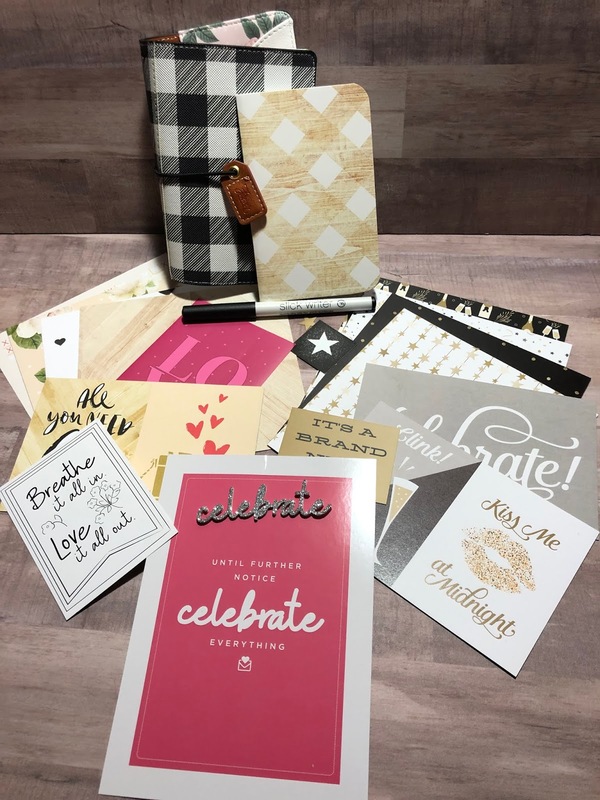 The big goodie was a Websters Pages travelers mini notebook a pocket notebook!!! As well as papers from one of their collections. So much yumminess right here. I also did a video to share more in detail what I received. If you would like to check out my other videos on my YouTube channel, just click on the link and it will take you to my channel "Tracy's Treasures24"
Oh right and those Samplers from last year.......they will be getting used this year!!! 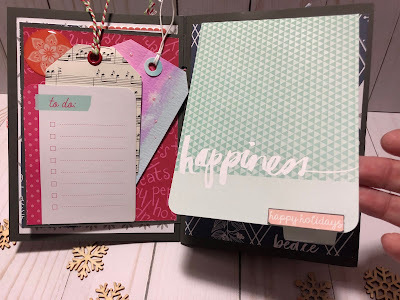 I made this mini album/journal with my SCT Sampler kit from December. 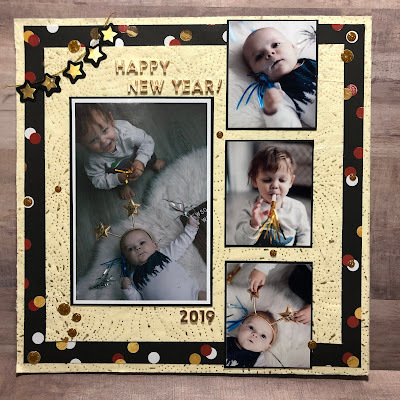 Can you believe this is only the second project I have made with my Samplers from 2018, and I have been receiving them for a full year already! But I have plans for them all for this year!! 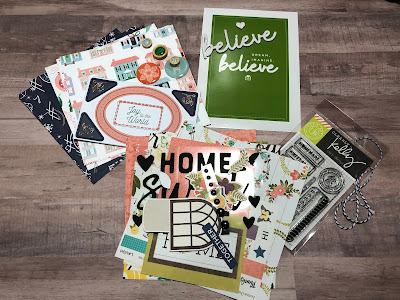 Because the SCT Sampler is just that..a sample of products, the size of the papers is 6x6. 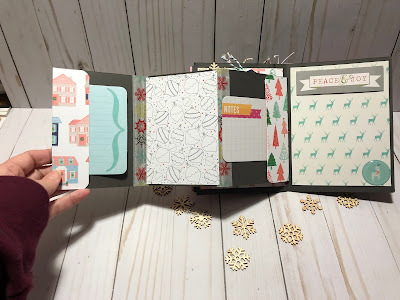 My album is 5"x 6.5" so I used cardstock to construct my mini book and decorated with the pattern papers and embellishments. This is the cover of my mini album. 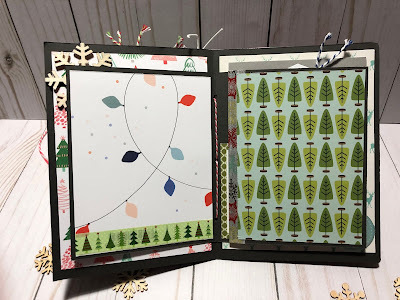 Every month there is a inspiring card and this was the card from the December kit. I added the strip tree sticker to the bottom of it and the banner at the top. I added a pocket to this page and left the second page blank for a nice big photo. I added a tuck and a PL card. The facing page is a smaller size with a small pocket with mini tags that I punched out of pattern paper. This page I made a side pocket with a couple of tags. The pink tag is an extra one I had made for the Christmas Tag exchange I did with my friends. 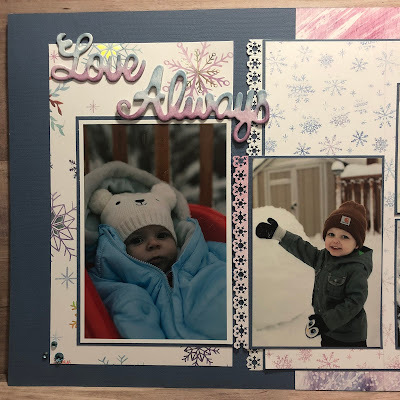 The facing page is a flip up....I used a PL card for the flip up. The next page I left just the pretty paper showing so I can add a photo or two. 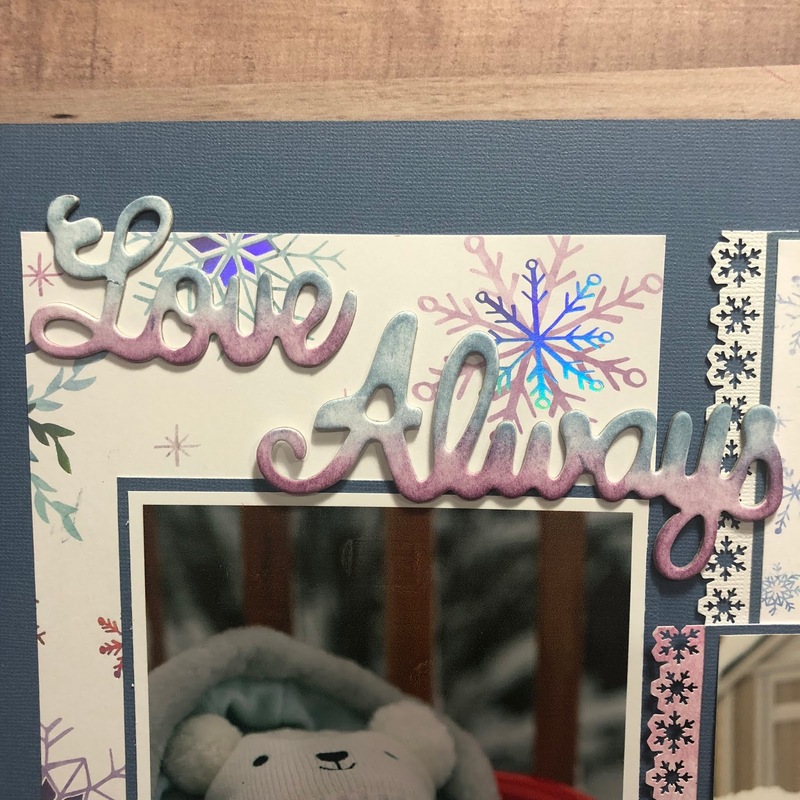 I did add a wood veneer snowflake with a sparkle snowflake on top of it. 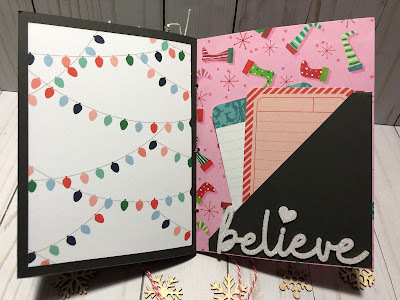 The following page is a smaller page (which is also a large flip out pages) I just added a PL card and some more of the sparkly snowflakes to it. This is the inside of the big flip out page. Isn't this just so much fun!! 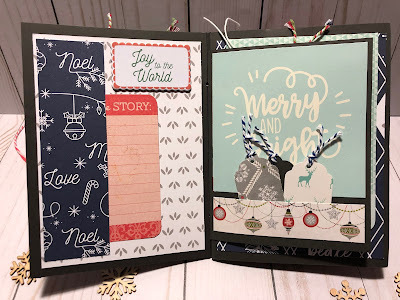 I have a photo page with washi tape on the botom, then a pocket with a couple of tags, a double flip with PL cards as the flip cards and lastly another full page for photos. 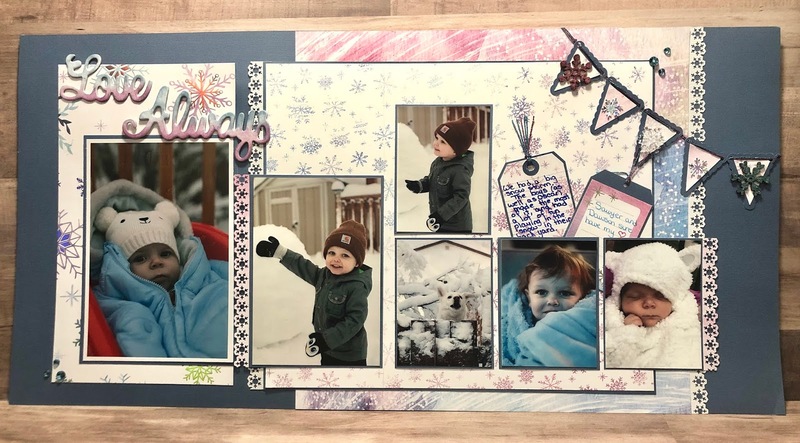 This is the other side of the Big Flip Out Page! 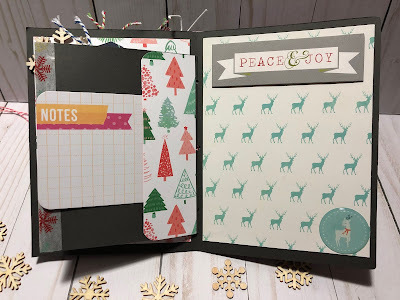 It has a tuck page with a PL card tucked into it, a plain page for bigger photos, another tuck page (to keep it symmetrical teehee) and another full page with a banner and a resin deer sticker that matches that adorable deer paper. 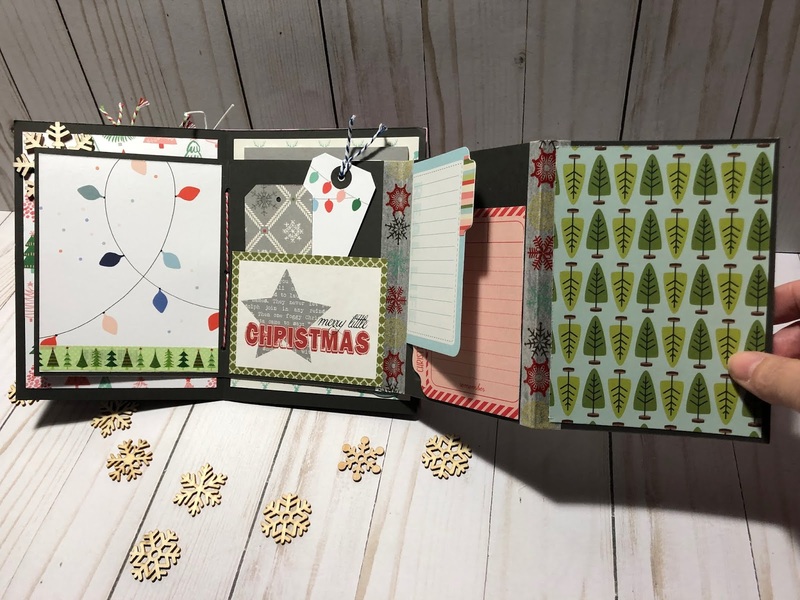 Here is the pages with the "Big Flip Out Page" closed. I left another pattern page for a bigger photo (now to add those photos) as well as a bit smaller page for interest. 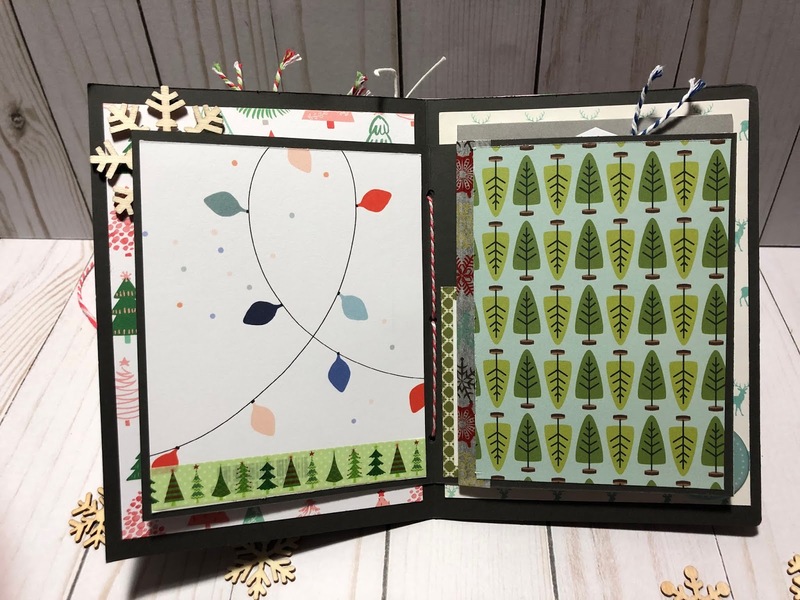 The tree paper is actually a pocket, but I forgot to add the tags, lol. This cute penguin card was left over from a Scrapbook and Cards Today Christmas album kit, as is the Christmas countdown card with I added a tab and made it into a flip page. 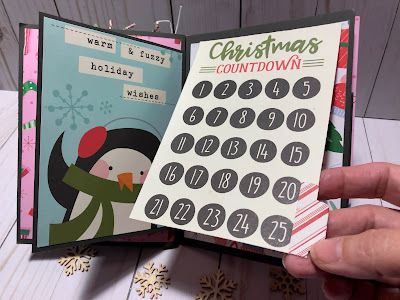 My last page is mostly just for photos and the next page I put a side pocket for some journaling cards. I also made a video walk through of my completed album. If you would like to check out my other videos, just check out my YouTube channel Tracy's Treasures 24. I hope you all enjoyed my mini album/journal....now to go and print up some photos!! 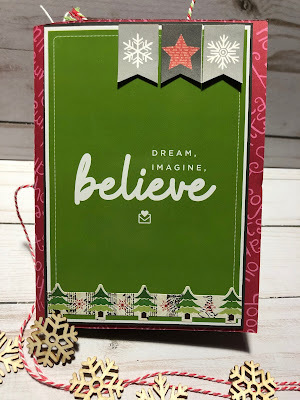 I was going to share this when I completed the project I had planned to make with December SCT Sampler. But the video was going to be to long, so decided to upload them separately. If you want to see what goes into this kit, check out the video for the goodies. To check out my other videos on my YouTube channel, just click on the link HERE. 2018 has given me many blessings. The birth of my second beautiful grandson. So much time I am able to spend with my husband, daughters, grandsons and friends. Purchasing a new cottage for us, and selling ours (which is right next door) to our daughter and her husband...so our grandchildren are next door to us during our time out there. A great group of friends that make me laugh and that we are each others biggest cheerleaders. A beautiful country that I am lucky enough to live in and the freedom to do what I love. 2018 has also taught me many lessons, some very eye opening lessons. I have always been close to family, very close and I would do almost everything for them. But this year has taught me who is genuine and who isn’t. Who loves me and whose intent is to hurt. Call me naive (or as I like to say “they couldn’t have meant that"). So this year has opened my eyes to people showing me who they really are and I’m focusing on those who are genuine. 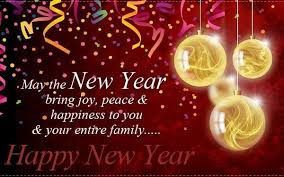 The year to hold those that are important to us even closer and to focus on those that love us. I hope you are all so blessed to be able to spend this holiday season with your family and close friends. I am a SAHM (who never gets to stay at home) to 3 beautiful teenage daughters Ashley(born 1989) Heather(born 1991 and Kristy(born 1995). Wife to my wonderful hubby Wayne. We have been married since 1988. I am a bookkeeper for my husbands business. I love to create. I dabble in all types of crafts. Jill of all trades expert in none. Right now I enjoy scrapbooking and paper crafts. 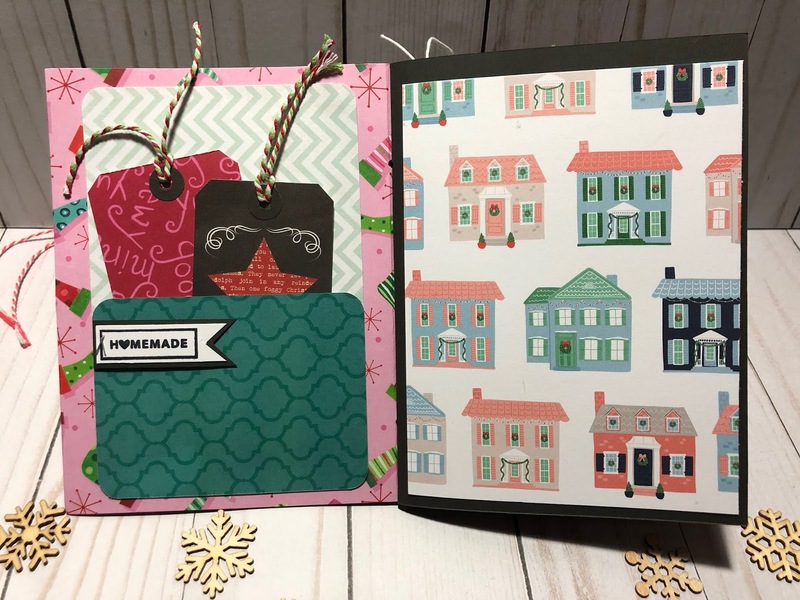 I decided to make this blog to share my creations and a bit of my crazy life. Thanks for visiting.